The Best Things in Life...: Win a crap book! I received a sample of this dried soup mix in the post. 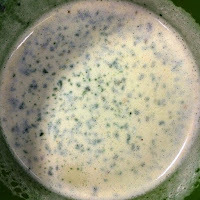 It allegedly contains all the minerals, vitamins and protein needed for those over 50. I'm in my late forties so maybe I've done irreparable damage to my insides. It tastes OK. Just like weak chicken Cup-a-Soup. There's no lumpy bits - no croutons or dried veg - just some green bits that could be parsley. This stuff retails for around £5 for 4 sachets whereas Bachelors Cup-a-Soup is around £1.20 for 4. So those added vitamins must be worth a lot, right? Or maybe this is Nestle's latest attempt to stop a demographic getting their vitamins by natural means? Now that people are wise to their aggressive marketing of formula milk to third world countries then maybe they have turned to using us first world middle agers to expand their evil empire? As I say, it tastes OK. If I were you I'd buy normal dried soup mixtures and vitamin supplements or make your own chicken soup. You could sell it to African kids and become an international corporation. 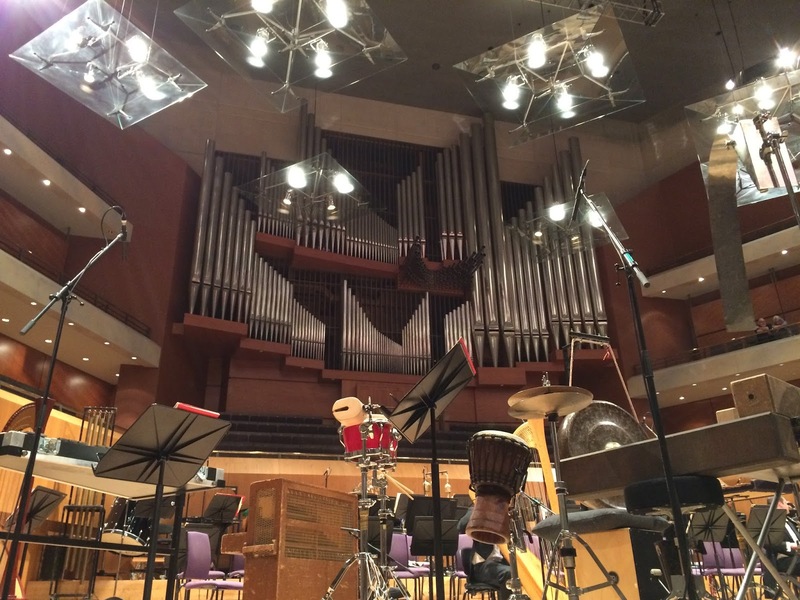 BBC Philharmonic at The Bridgewater Hall. 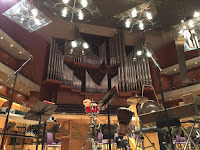 Can you believe that in all the years I have been in and around Manchester and with my fondness for a bit of classical music I have never been to the Bridgewater Hall? Well, my freebie adventure has resolved that. Built in 1996 to replace the tiring Free Trade Hall as the home of the Halle Orchestra and with state of the art acoustics, the hall is a breathtaking performance space. It's external shape is fine, pointing valiantly toward the city centre, but the materials seem dated. Inside it is wonderful. The foyer is average but the concert hall itself is stunning. Fans of straight lines should head to the auditorium where the seats aren't just on rows but large cells, all designed for acoustic perfection. I was lucky to have my free ticket right in the first row. Well, luckyish. I had the perfect view of the solo performer for the first piece - 'A table of noises' by Simon Holt.The performer was Colin Currie, for whom the piece was written, and from my six foot distance I could see the concentration and skills with which he played each item, accompanied by a selection of orchestral instruments. I've said before that I love seeing art and artists at work, whether in the creation or the performance of that art. This freebie blog has taken me to things I wouldn't ordinarily have gone to and it has helped me find new things to enjoy. This wasn't one of them! Undoubtedly talented and ticking all my creativity and performance boxes, but too syncopated and avant garde for me to appreciate. After the break was my cup of tea. Conducted by John Storgards the whole BBC Philharmonic took the stage for Mahler's seventh symphony, the soaring 'Song of the Night'. Why does Mahler get classed as heavy, I wonder? I've a few pieces and CD (but not the 7th) and find them quite invigorating and moving. This one was no different and my body tingled through the final movement with it's rousing but abrupt finale. I've said it in several blogs before, I'm no muso. I write to express my opinions and to analyse fro my viewpoint, which in this case isn't that of an educated expert. To me, the performance was perfect and it's fun watching a conductor and wondering how his movements can be so important. I know they are, because every one of those talented musicians on stage kept their eyes on him. Marvellous how he waves an arm, someone draws horsehair over catgut and such exquisite beauty emerges. For fellow non-musos the 2nd movement was used to advertise Castrol GTX in the early eighties. 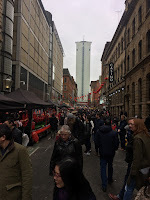 Chinese New Year - Manchester. I'm not going to review Chinese New Year - what right have I? I'd be happy to hear what my being born in the year of the pig means though. 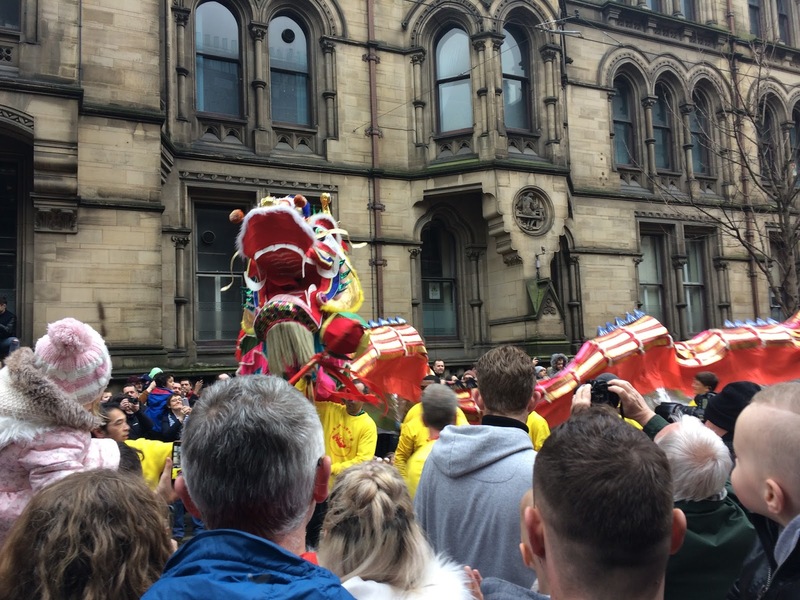 This wee piece is just my experience of taking my family into Manchester to see the traditional parade. Again - 26 years in and around Manc and this is the first time I've done this. Disgraceful really. We headed straight to Charlotte Street to soak up the atmosphere in Chinatown itself. I'm glad we did - reasons later. A few stalls and fairground rides around here but we headed straight through and towards the Town Hall. In Albert Square there were a few more stalls with Chinese toys (clacking drum things, paper dragons, that sort of thing) and some Asian food stalls. The square was quite busy and the view of the entrance poor so we headed round the corner and took up our spot on Princess Street. 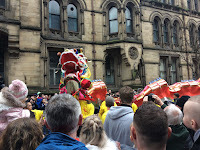 This too fills up but after about half an hour the dragons appear and bounce along the street, sweeping over the crowds to the accompaniment of drums (quite the percussive blog, this), back and forth the dragons dance, up and down their lengthy bodies. Great fun and a wonderful way to celebrate a cultural event. Sweets are given out and as the parade passes we follow towards Chinatown. Yowser. Here it gets busy and, in my view, dangerously so. Crowds hold themselves inches from the tram track as trams crawl though and the small side streets of Chinatown are blocked off leaving the crowds to walk around looking for a way in. We gave up and, glad that we had at least walked though Chinatown before the parade, headed home. I wasn't content to leave town without eating some Chinese food but with everything choc-a-bloc we settled for noodles near the station. I great, free, event and there are a lot of other things going on around it in places the art gallery and central library. Can't wait for next year, and a happy year of the dog to you all. Before I go by Catherine Cookson. Another Goodreads win - I won this for my mother but decided to read it first. Rather wish I hadn't! The review below is from the Goodreads site. Another win from Goodreads and one I entered in the hope of a surprise for my mom - a big Catherine Cookson fan. Hands up from me - I've never read a book of hers but I am told that they aren't your typical family saga. No reason why only middle aged women should be the only ones to read a particular genre but there are genres that do have audiences of a particular demographic. The majority of Cookson's readers (and there will be many - she was the most borrowed author from British libraries for several decades) will be women. When I was about ten I was given the responsibility of running the book stall at a fundraising jumble sale at my local chapel. People brought bags of old books as donations and I arranged them and sold them for a few pennies in aid of the church. My mom left me with a little instruction: "If anyone brings 'Our Kate' by Catherine Cookson then put it to one side and I'll put the money in the pot". I was so happy to open almost the first donated lot to find that very book and Mom was just as happy too as she dropped the pennies in the pot. She'll be delighted when she gets this too. This book follows on from previous biographies and autobiographies (such as 'Our Kate') and is a previously unpublished memoir. To be honest, as my first experience of Cookson I wish it had stayed hidden. Cookson doesn't come across as particularly likeable to me and I feel bad about that. Catherine Cookson came late to writing. Before then she earned a living through hard work running laundries and as a landlady. During this time she kept patience with her chronic alcoholic mother and was taken advantage of by several people she befriended, some for many decades and well into her years of fame. Cookson knew she was being taken advantage of but, and this is going to sound awful, she does seem to relish the victim state. She had several various serious illnesses and conditions throughout her life that eventually left her blind. She suffered a lifetime of bleeding and there is no doubt suffered long bouts of pain. Coupled with several heartbreaking miscarriages and it seems harsh of me to say she enjoyed relished being a victim but on top of this we hear about her debilitating fear of heights (she cowered on the back seat when driving on mountain roads) and other conditions that, to be honest, aren't really that serious and sometimes one can perhaps understand why several doctors fobbed her off even when she was ill. As well as illness the book also details many, many people who did Mr and Mrs Cookson wrong. In fact, one suspects the memoirs are little more than a black book of hate. The only person who has Cookson's unswerving love and devotion is Tom, her beloved husband. The love appears mutual and together they faced the endless trials like Mr and Mrs Pooter. The book does touch upon the journey to becoming a famous writer but not enough to make this a book about her career. I am assuming that aspect is covered elsewhere. All told, this is one for the fan who has read everything else - the tagline on the back "A story of talent, good humour and determination" is quite misleading. Quite a spectacular giveaway in Manchester Piccadilly Station last week. Thousands and thousands of these tubs were given away and they weren't sample size - they were your full size comfort eat. I didn't risk trying to get it home, I ate it at my desk and felt sick for the rest of the afternoon. That's not down to the product, that's down to greed. 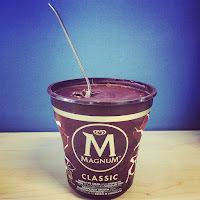 You know your average Magnum on a stick is a creamy white ice cream covered in lovely Belgian chocolate? (I think it's Belgian, it tastes Belgian). Well image that ice cream filling a pot but still being surrounded by that chocolate. Yes, that's what his is - the entire pot is lined with chocolate and the chocolate filled with ice cream that itself has shards of chocolate in it. The idea is that you squeeze the pot to crack the chocolate and then smash through the lid to get at it - boy was it good. 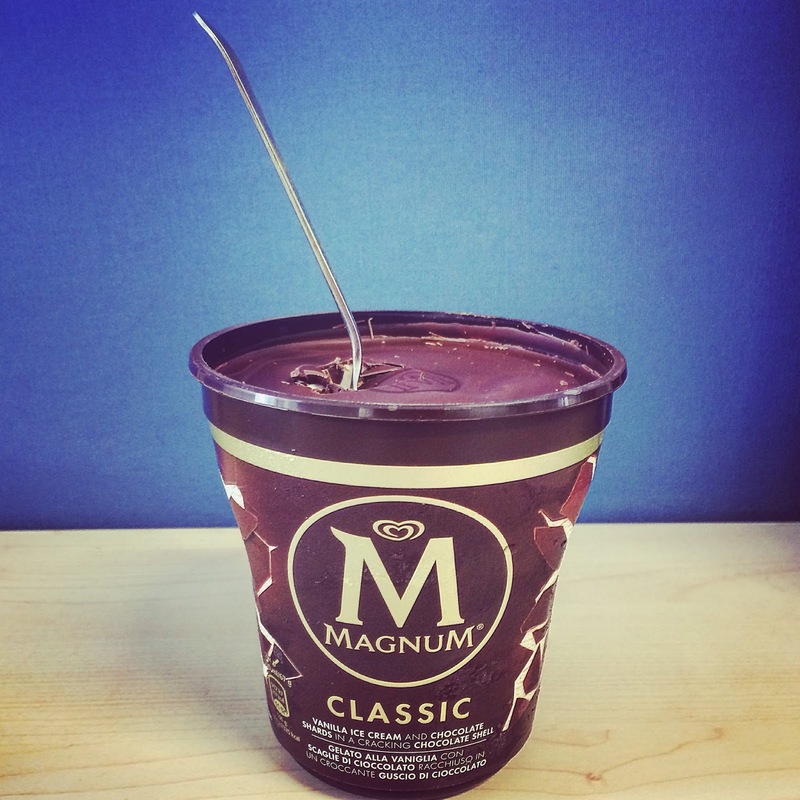 The chocolate really is something else (the ice cream I can take or leave). My challenge with my remaining pot is to see if I can get it out like a sandcastle rather than cracking it. Photos will follow if that is achieved. yet another Goodreads win and one I'm going to giveaway to one of you lucky readers. I'm not expecting many entries as I gave it a stinking 1 out of 5 stars! But it's all about opinion - maybe you disagree? Win it and let me know. Osho was an Indian spiritual guru who spread his teaching in Asia and the US until his death in 1990. His advocacy of more open sexual relationships was perhaps ahead of its time and stems from the overarching theme of love and happiness. Osho eshews family and marriage and this book wholly relates to his teaching of meditation and love of oneself. Everything is about oneself and to love oneself is above all things. I fully agree with peace and love. Nothing epitomises my own beliefs more than this. I disagree with Osho's demands for communes and no families, with the selfishness of love for oneself and the simplistic belief that if everyone did as he said everything would be alright. The book refers to many religions and most of them are criticised (fairly in most cases), with Hinduism and Buddhism coming closest to being near Osho's own beliefs. On a general level I can see the frustration in politics and religion keeping people in their place but this is the outcome of moral corruption and not the primary purpose. I don't believe that without organised religion and a political system people would all be happy. Two passages sum the book up for me. The first is Osho's description of his childhood "I have never been associating with people....they thought something was wrong with me"; "The reality is something is wrong with you, I am perfectly happy to be alone". Fair enough, but why make this the basis for teaching and a belief that everyone should follow his guidance? The second passage is on the next page: "When I became the professor at the university...I used to park my car under one tree". You'll need to read the entire book to understand why this annoyed me, but 240 pages telling you to do nothing but meditate, love yourself first and just be, rather than think. Who services the cars, mends the roads or runs the university? Nah, I'm not buying it. How this became a career is beyond me and advocating freedom and fulfillment in a book selling for $16.99, with links to the Osho Meditation Center and other corporate moneymakers does nothing for me. If Osho were around he'd probably just look at me with a sad smile and tell me that I just don't love myself yet. Fair enough, but I'm not believing the religious man either. Free weeks of threebies - win three free fings!